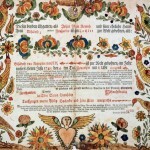 As devout a Christian people as the Quakers were, they did not express their religious belief as dynamically as the Pennsylvania Dutch/Germans, whose American Folk Art spilled over from the Bible into all their furniture and household belongings, as well. 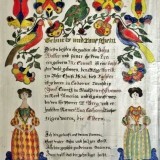 These Rhineland immigrants who feared being chastised for their religious beliefs in Europe by rival Kings and noblemen were for the first time in their lives free to practice whatever faith they chose without incrimination to them and their families in America. 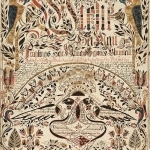 Thus, the folk art symbols, which they were not able to demonstrate without calling attention to their personal belief in a deity, were now free to be expressed in the New World under William Penn, one of the first proprietors to believe in Freedom of Religion. 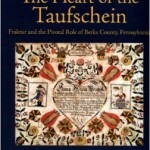 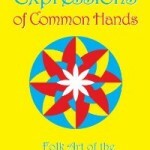 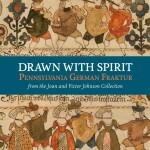 → The Historian: Fraktur, the folk art of the Pa. Germans - berksmontnews.com Read this article for a concise introduction to the basics of Fraktur.